From February of 1924, a portion of the reserve was leased to a returned servicemen, Joe Findlay, who operated a small fruit and soft drink stall. It appears, however, that Findlay and a predecessor, ‘Windy’ Robinson, were providing these basic facilities for some years prior to the approval of this lease. In 1926, the lease was transferred to Pat (Thomas Patrick) Sweeney (ca. 1885-1969) who, with his wife, Mary (Josephine Mary), and their daughter, Patsy (Patricia Josephine), continued to operate a kiosk until the lease was revoked in 1960. The Sweeney’s makeshift house, made out of timber recycled from wooden car cases, was located in the reserve. There were bathing sheds and toilets and many people have recalled that the family kept emus and kangaroos. After the first kiosk was damaged by floodwaters in 1927, a more substantial building, referred to as the Wembley Kiosk during the late 1920s, was reconstructed on higher ground. Despite the closure of the kiosk in 1960, the Pine Rivers Shire Council permitted the Sweeney family to retain the use of their home. The last family member to reside in the house, Patsy (Patricia Josephine) Eviston, nee Sweeney, passed away on 25 April 1994 and the house was demolished soon thereafter. A plaque commemorating the life of Patsy Sweeney is located near the site of the house. Although there are no records held by the Moreton Bay Regional Council which indicate when the area was first officially referred to as ‘Sweeney Reserve’, it appears that the informal application of this name dates from the 1960s. 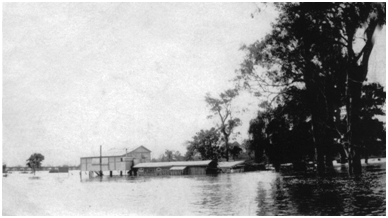 North Pine River floodwaters encroaching upon the Sweeney family residence at its first location, late 1920s. 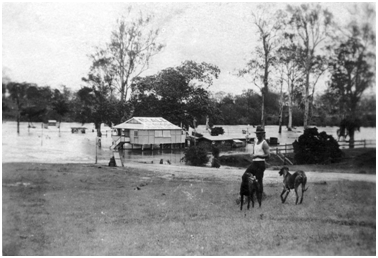 North Pine River floodwaters encroaching upon the Sweeney family residence at its second location, 1931.